​Female Ninja Assassin - She wields a pair of bladed sai as her trademark weapon. Elektra's primary abilities are a strong knowledge of martial arts and weaponry. Elektra learned ancient martial arts of China, Siam, and Japan. She is a master combatant with the Japanese Sai, her usual weapon of choice. She is also highly skilled with the katana, daggers, three-sectional staff, and shurikens. She is a master of many Japanese combat forms including Ninjutsu. Elektra is an Olympic-level athlete, strong in gymnastics and swimming, with a high level in athleticism in human strength, speed, stamina, agility, dexterity, reflexes & reactions, coordination, balance, and endurance. She is resistant to pain and extreme heat and cold. She is also able to keep to the shadows and move with such speed that she can remain unseen even in daylight. Elektra has the ability to mesmerize others, and as such make them see illusions or other phenomena. After Elektra's dramatic death at the hands of Bullseye in "Daredevil," she is revived by the mysterious martial artist sensei Stick. Although Stick mentors Elektra, he decides to drop his protégé because of her arrogant nature, provoking her to begin a life as a ferocious assassin. The film follows Elektra as she tries to save those she loves and trusts while simultaneously fighting her personal demons and the dangerous assassin clan known as the Hand. 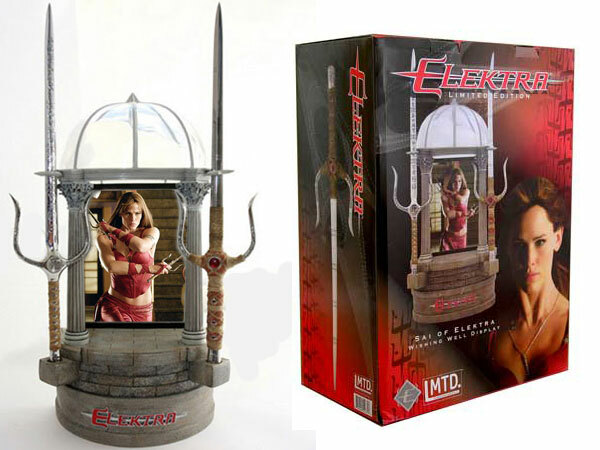 Elektra Movie Prop Peplicas, Figures, Toys and Collectibles! Elektra: a martial arts prodigy; a mercenary for hire; a hero returned from the dead. All true, but the one word that sums up the character of Elektra is "assassin." And nothing says "assassin" like this movie replica of the armband worn by Jennifer Garner in the Marvel film. Crafted with an adjustable leather armstrap, this stainless steel piece (with visible Japanese characters) measures 2" wide and 4.5" long and has an overall length of 14", and is limited to 1,500 pieces worldwide. A martial arts prodigy, a mercenary for hire. The armband of Elektra sums up the character in one word, Assassin. Limited offers a piece of the movie with the exact replica of the armband worn by the legendary assassin Elektra (played by Jennifer Garner). Crafted with an adjustable leather arm-strap, this stainless steel piece with visible Japanese characters with a limited number of 1500 pieces makes for a great accessory.